ONE-OFF MMS NOVEMBER 2018 24 mmsonline.com you with the learning cur ve. • Unattended machining. The two-shift SHR shop works to implement unattended machin- ing as much as possible these days, including lights-out machining when it makes sense. Running unattended during the day frees oper- ators to tend other machines or perform other value-adding tasks. Parts with very long cycle times, such as the front spindles, are typically machined overnight. 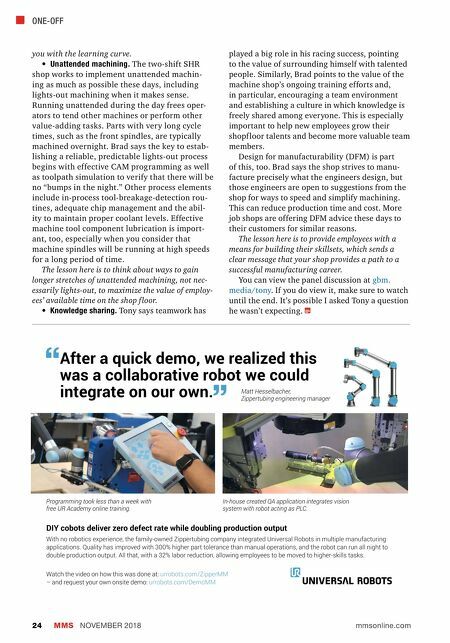 Brad says the key to estab- lishing a reliable, predictable lights-out process begins with effective CAM programming as well as toolpath simulation to verify that there will be no "bumps in the night." Other process elements include in-process tool-breakage-detection rou- tines, adequate chip management and the abil- ity to maintain proper coolant levels. 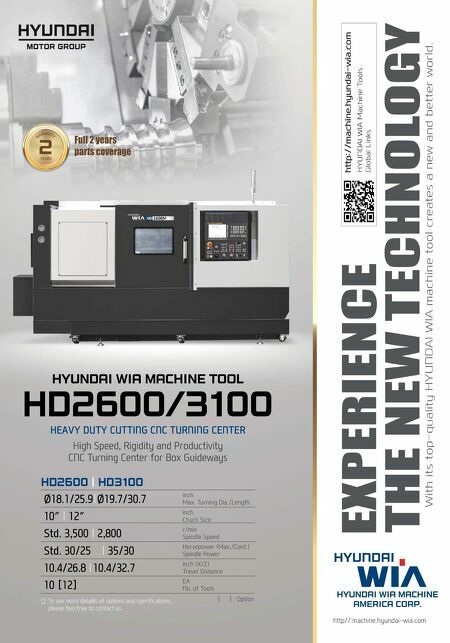 Effective machine tool component lubrication is import- ant, too, especially when you consider that machine spindles will be running at high speeds for a long period of time. The lesson here is to think about ways to gain longer stretches of unattended machining, not nec- essarily lights-out, to maximize the value of employ- ees' available time on the shop f loor. • Knowledge sharing. Tony says teamwork has played a big role in his racing success, pointing to the value of surrounding himself with talented people. Similarly, Brad points to the value of the machine shop's ongoing training efforts and, in particular, encouraging a team environment and establishing a culture in which knowledge is freely shared among everyone. This is especially important to help new employees grow their shopf loor talents and become more valuable team members. Design for manufacturability (DFM) is part of this, too. Brad says the shop strives to manu- facture precisely what the engineers design, but those engineers are open to suggestions from the shop for ways to speed and simplify machining. This can reduce production time and cost. More job shops are offering DFM advice these days to their customers for similar reasons. The lesson here is to provide employees with a means for building their skillsets, which sends a clear message that your shop provides a path to a successful manufacturing career. You can view the panel discussion at gbm. media/tony . If you do view it, make sure to watch until the end. It's possible I asked Tony a question he wasn't expecting.